Once the capital of Myanmar, Yangon offers a beautiful blend of ancient and modern architecture that dates back several centuries and includes foreign influences too. 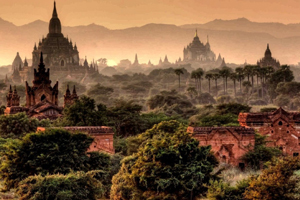 The country’s largest city is home to a number of important cultural attractions, including the incredible 2,000 years old Shwedagon Pagoda and its magnificent golden stupa, which can be seen from practically anywhere in Yangon. However, the city is also home to a range of modern cultural attractions, including fabulous art galleries and splendid museums. We will encounter local artists and their special techniques to ensure that you acquire authentic experiences with the real people of Myanmar. We will additionally see several other Buddhist sites including Kyauktawgyi Pagoda and tourists will be spoiled for choice when it comes to cultural heritage attractions (including British colonial examples too). Food-lovers will be thrilled to see the thriving restaurant scene that includes an intriguing blend of foreign and local foods and whether it’s seafood or curries, visitors will be presented with a range of tasty choices that are unique to this special city.